Did you know you can help stuff the Pacer Green Can while you shop on Amazon? Sign up through AmazonSmile and 0.5% of your purchases will go to the Club! Now, you know the Pasadena Pacers is a friendly, FREE running club, but you may not know it’s not free to operate. We’ve got bills like everyone else (this very website takes cash to run) which means we need to generate all our operating costs from donated dollars. AmazonSmile gives us another way to sweeten the pot (or Green Can, as it were). Sign in with your Amazon.com credentials. Search for “Pacer Nation” and select it. Start shopping! Note: you do have to shop from smile.amazon.com in the future for your purchase to count. 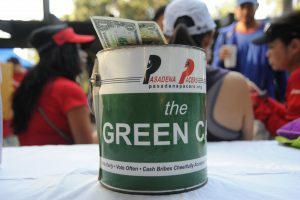 Stuff the Green Can with cash at your next run. We also take payments through PayPal. Company matching. A bunch of awesome companies match your donation to make it go the extra mile (see what we did there?). Sign up to bring food/water/treats at the next run. It doesn’t go to operating costs, but it does help our runners do their thing. The Pasadena Pacers (aka Pacer Nation) is a 501(c)(3) non-profit, charitable organization and donations are tax deductible. Our Tax ID is 47-2143278.